Clickshare, from Barco, is a tool for quickly getting the display of a computer onto a projection screen. 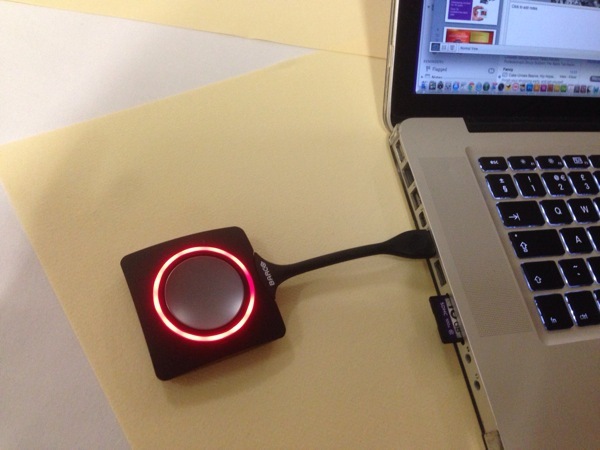 It works by connecting a Clickshare wireless hub to the projector and plugging a special USB click button into each laptop or computer to be shared. When a user clicks their button, their computer display is replicated live on screen. It is possible for up to 4 users to share the projection screen at once (split screen) or by simply holding your click button for longer a user can completely take over the screen. As well as the USB click buttons, there are apps for iPhone, iPad and Android to share device screens too. The system can work with up to 64 devices at one time. This makes it ideal for presenting feedback from breakout groups or workshops to a main group. For computers there is no software to install, users literally plug the USB dongle and they are ready to go.